Ok, seriously folks, I didn't meant to have so many giveaways running together but that's just the way we're apparently rolling this week! I was asked if I wanted to review a copy of Skinny Is Overrated : The Real Woman's Guide to Health and Happiness at Any Size about the same time I received my copy of The 90-Day Fitness Challenge in the mail. I thought the two would be fun to read and work through together. I also previously mentioned that I had never seen an episode of The Biggest Loser, which sparked the The 90-Day Fitness Challenge (the book was authored by two former contestants.) Cassandra mentioned that I could watch an episode of The Biggest Loser on hulu.com and my obsession with the show is now ALL HER FAULT! So between the 90-Day Fitness Challenge, watching the latest season of The Biggest Loser on hulu, and reading Skinny Is Overrated -- I'm feeling a little motivated! 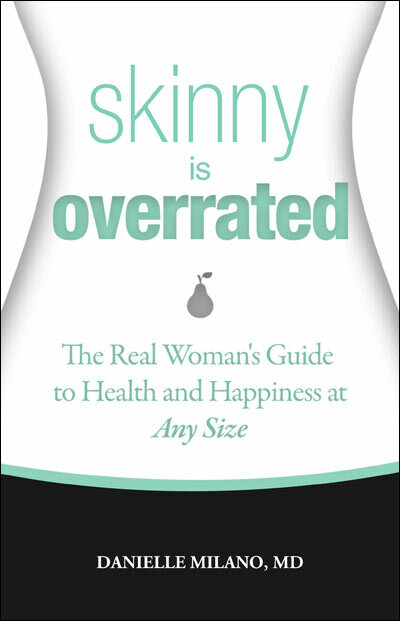 Skinny Is Overrated is written by Danielle Milano, MD, who works in East Harlem treating people suffering from obesity and diabetes. She decided to write this book because her clients kept asking her what they should be eating. This book is her long-and-short-of-it answer. Perhaps there is nothing ground-breaking in this book. You've got the usual stuff - work out a little, "eat right" and make good choices. She's not screaming "LAST CHANCE WORKOUT!" at sweating people. Rather, she's just answering the question, in some detail, about what eating "right" means. I found this resource helpful and beneficial. She spelled out why it's important to have so much of this vitamin and that fat in your diet in order to be healthy. She stresses that the goal is not to be skinny (although surely you will not be obese if you take care of yourself!) but to be healthy. She looks down upon the pressure that modern society places on women to be thin for the sake of appearance. Thin people can be unhealthy and she points out that it's better to be a healthy size 12 than a sick size 2. The point is health and she emphasizes that throughout the book. Dr. Milano is probably the most conscientious writer out there when it comes to the topic of what it means to live on a real-life budget when you are trying to eat healthy. She offers you practical advice on where to spend the money that you have to receive the maximum benefit. I appreciated that she was writing to the middle-to-lower income reader when she was dispelling her wisdom and advice. It wasn't about buying a Body Bugg (although I want one!) or eating a particular brand of food that is helping her advertise her book! It's just plain good advice which makes plain good sense. That all said, I do feel like I need to give the following disclaimer and concern that I had about the book. I did not agree with her world-view and so I did have to ignore that to varying degrees throughout this read. Milano suggests that readers might want to "adopt a goddess" to help motivate us along through our journey to health. Milano references Reverend Sue Brockway, an interfaith minister, who offers a list of goddess to choose from to motivate you towards realizing your goals. Obviously, I would not agree that the way to reach goals is enlisting the help of goddesses and I reject her suggestion that this is a good idea point blank. Thankfully this discussion all takes place in Chapter 3 entitled, "Get Motivated!" and after that, the concept of goddess strengths die away and practical know-how comes into play. 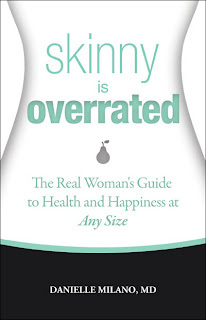 On the whole though, I found Skinny Is Overrated to be a practical and educational resource and I don't have any difficulty in recommending it. If you are also a Biggest Loser enthusiast - you'll definitely appreciate picking up a copy of this book! If you think you might enjoy reading this book, then I have some good news for you! The publisher has graciously offered a copy to one of you. This contest is open to residents in the U.S. AND Canada! To win? Leave a comment. If you want, tell me who you are rooting for in this season of Biggest Loser. =D (Personally, I think I'm going for Daris!) This contest will be open through May 19th. i don't watch Biggest Loser, so i cannot comment on that. But, our personal health is so very much in our own hands. Yes, there is heredity ... but there are factors WE can modify, too: what we eat, and how much we MOVE! Great giveaway! I also like Daris!! I have really mixed feelings about this. I agree with most of what she says.Not everyone (me included) can exercise. I have put on weight because of it. I would really like to read this. Interesting... My hubby ordered his and hers pedometers last week and they arrived today. I'm thinking a little friendly competition might be more motivating than my own personal goddess. :) I also received the 30 Day Shred dvd today. I'm hoping to alternate between running and shredding. I have some work to do to get healthy so I'd love to read what she says about nutrition on a budget. Sorry for giving you a new addiction. ;) But the show really is great. Let's see... this season I'm rooting for either Koli or Daris. My favorite contestant was voted off already. :( So I had to pick someone new to root for. I don't watch the biggest loser. I think most women have an unhealthy outlook as far as our own bodies are concerned. I would love to read this book. I don't watch biggest loser, but am interested in this book. I believe very strongly in being an advocate for our own health. Looks like we pretty much agree about this book. The motivational section didn't do much for me at all, but I like how she explains what to eat and what not to eat and why. I found those chapters really helpful. I love the idea of this book! How great. Daris is my favorite of the remaining contestants. I'd love to read this! And yes, I'm rooting for Daris too! He is such a sweet boy!